Oh my goodness, since discovering salad beans just a week ago and having used up my packet, I am now craving them again. Next time I'll get two or three bags. (1 pound each in Asda supermarket). I bought them because they looked nice. 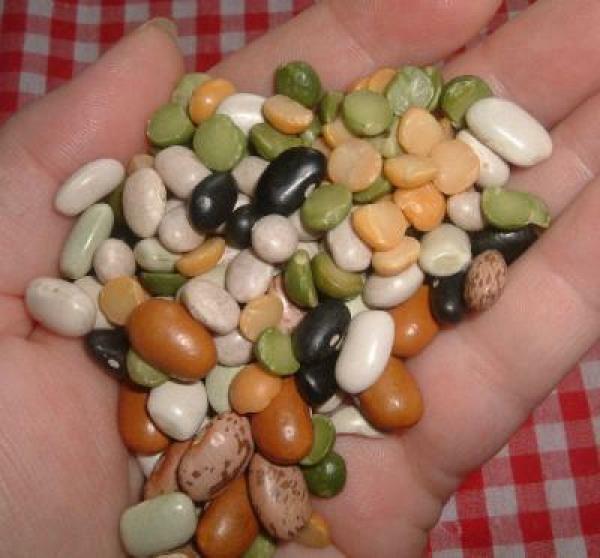 In this mixture of these little gems, there are haricot beans, green and yellow split peas, black beans, flagelot beans, and I can't remember the others right this minute. It said "Salad Beans" on the package. I had no idea what to do with them so I just put half a bag full in my slow-cooker with some chicken stock. I then added some left over sweet potato cubes. After cooking for most of the day I turned it off and left it. When I went to look at it later the beans had become quite soft and it had become a kind of mushy beany mash. What to do with it? I scooped out a few spoonfuls and put in a plastic bowl and then added some cajun spice and popped it in the microwave to heat up. Oh my goodness! Sheer delicious comfort food and so yummy! I ate it with some Garlic and Coriander Naan breads. Afterward I thought how healthy the meal was. No fat, high in protein and brimming with goodness. The next time I made a pot I added cubed cuts of bacon and sunflower seeds. To die for! I have been wondering what else I could add to it, apart from meats. I was thinking to add red and yellow peppers, add some 'meaty' mushrooms, add chillies, courgettes, vine tomatoes or practically any other vegetable that is a favourite. Adding them at the end of cooking time so they retain all the vitamins. Source: All my very own! You are adorable and your excitement about legumes is so refreshing! You keep up doing what you're doing and write down your recipes to submit here for weekly contest! I am sad they didn't add the picture I sent in because they are beautiful little gems. I have a new recipe with lentils and turkey which I will add soon. I do like all this experimenting though I don't actually like to cook normally! Any recommendations would be gratefully received too. Editor's Note: Sorry, Monique, we didn't receive this photo as part of the entry. We try to post all photos we get, if appropriate.